Professional surfer Bianca Valenti of Marin County wins Association of Surfing Professionals (ASP) Women’s SeaHawaii Pro at the world famous Banzai Pipeline on the North Shore of Oahu. Bianca Valenti smiling big after a monumental accomplishment! I entered the contest hoping to surf one of the worlds best waves. I am so happy and proud to have achieved this goal! On Friday, March 9th 2012 the ASP Women’s SeaHawaii Pipeline Pro short board competition ran in treacherous conditions at the world famous Banzai Pipeline on the North Shore of Oahu. The contest got underway in the gnarliest conditions ever, in the history of the event. Stormy conditions delayed the event until the final day of the holding period and the girls were forced to brave 10-12 ft waves with wind swirling in every direction in chocolate brown water (from 7 straight days of Monsoon rain prior to the holding day of the event). Valenti, a talented water-woman, had her eyes on the biggest waves of the event, and rode them with style, grace, power and courage, earning her the SeaHawaii Women’s Pipeline Pro Title. Bianca is no stranger to dumping beach breaks as a resident of Marin County/San Francisco. Her knowledge and experience proved its worth, as each heat she passed through with the onlooker’s impressed approval. She proved on this Aloha Friday, that she is not just a talented surfer, but an incredibly smart and adaptive competitor choosing the waves that offered the highest scoring potential in big stormy surf without following the other competitors who were swept down the beach in seconds. 26-year-old Valenti is a seasoned professional long board competitor. 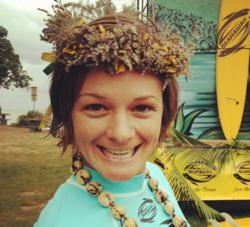 She started competing professionally at age 15 on the long board circuit, but always kept her studies at top priority. While attending UC Santa Barbara as an undergraduate she found a new love for surfing big waves and barrels. After graduating UCSB with a B.S. in Global Studies and a minor in Sports Management she did everything she could to find good barreling waves in the likes of Hawaii, Mexico, and Northern California. She has been a full-time Marin County resident for a few years. When she's not spending time in the green room (a.k.a. barrel) she enjoys running her stand up paddle school Stand Up Paddle Marin as well as helping run her family’s restaurant. This was the first professional short board competition for Valenti to win, and she has plans of traveling on the surf tour to finish out the great start to her 2012 season as an ASP short board competitor. Get to know Bianca Valenti better by checking out her Virtual Fan Card.